To people who live with anxiety, depression, addiction and suicidal thoughts, a semicolon can be much more than punctuation. 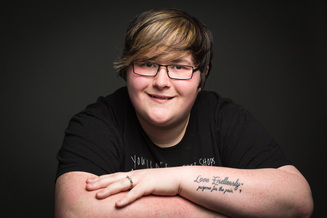 Amy Bleuel, founder and president of The Semicolon Project, has adopted the semicolon to represent perseverance and hope for people who live with mental health issues. Bleuel, who is 29 and from Green Bay, Wisconsin, created the project in 2013. The Semicolon Project is a faith-based nonprofit movement which aims to encourage, love and inspire people who live with mental health problems. Bleuel has lived with depression, anxiety and self-harming tendencies since she was 8 years old. After living through abuse and sexual assault as well as losing her father to suicide when she was 18 years old, Bleuel decided to share her story with the hope that it would help others overcome similar obstacles. As part of the effort to raise awareness, the project encourages people to draw or tattoo semicolons on themselves as a reminder that their stories aren’t finished yet. Hundreds of people have been taking photos of themselves and sharing the message on social media. The team at Blue Jay Tattoo got inked! Visit The Semicolon Project website. For more resources about mental health, or for more information about getting help, visit Mental Health America. Do you have a story about your experience with mental illness? We want to hear it. Please send it to [email protected] and include a photo for the story, a photo of yourself and a 1-2 sentence bio. More info here. Thanks!